Years ago, when we would fill out applications for medical insurance, the insurance agent would always ask us a lot of questions. One of the questions was: did anybody in our household do bull riding or parachute jumping. If I would have answered, “Yes” to that, the cost of the insurance would have gone up substantially. I would always answer, “No” to it, but the four of us here would always be grinning when I did so. While none of the four of us did those two things, we did have somebody in our household that did do parachute jumping. Joshua, our son, was born weighing just one pound and ten ounces. The doctors did not expect him to live. But we prayed and God answered our prayers. He lived and is a strong healthy young man today. Joshua, after he was born, had to spend the first four months of his life in the neonatal ward of the hospital. While there, one of the nurses gave him a little Elmo to snuggle up to. Elmo is only seven inches tall, but he was nearly the same size as Joshua was back then. Well, when Joshua came home from the hospital, Elmo came with him. As Joshua grew, we gave him and Elmo their own bedroom upstairs in our house. Kids will be kids, and kids love to play. Catherine and Joshua, all on their own, took a plastic, grocery shopping bag and rigged it up to Elmo for a parachute. Then they took and dropped him from the top of the stairs and let him parachute down. He floated down just beautifully. Joanne and I were really impressed at what they had done all on their own. After seeing them do this a number of times, I came up with a brilliant idea. I said, “You need to drop Elmo from higher up.” Well, they liked what I said, but didn’t know how to get him any higher up. Then I suggested, “How about dropping him from the top of our silos.” Their eyes got way big and the amazement on their faces was indescribable. “Do you think it will work, and will Elmo be O.K. ?” they asked. 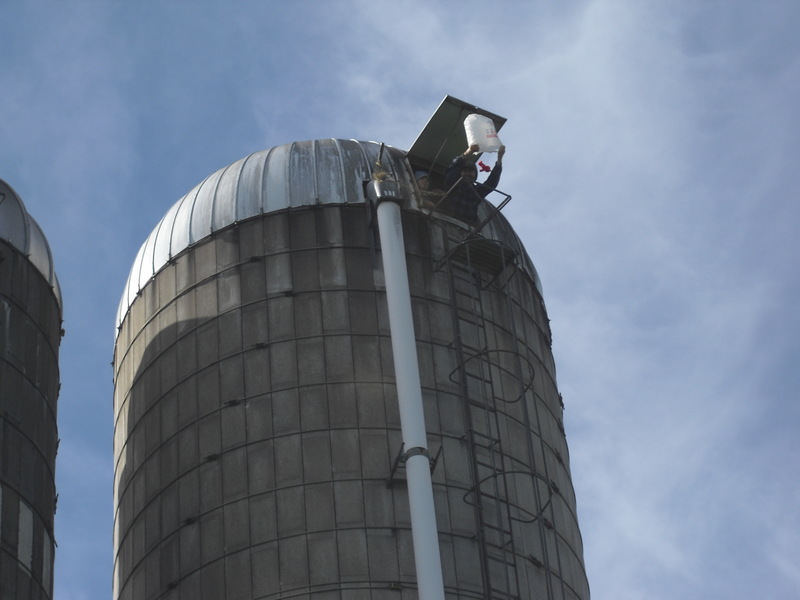 I replied, “I don’t see why it won’t work as long as it isn’t too windy out.” Well, with that answer, they eagerly awaited the next time I had to climb to the top of one of our sixty-foot silos. It’s wonderful when parents and children can play together and have lots of fun. When it’s time to fill a silo, I have to climb the ladder on the outside of the silo to raise the unloader, and then once the silo is full I have to climb it again to lower the unloader. Well, Elmo started going up the silo with me. Once on top, I would let him go and he would parachute gently down. It was fun and very interesting. But, I was hesitant to do it on real windy days. What if Elmo landed on top of the barn roof or on one of the shed roofs or got tangled up halfway down on another silo or something else? The kids always insisted that Elmo wanted to take the risk and do it. I would remind the kids that he didn’t have any health insurance since I couldn’t afford to pay the high premiums on him because of the way he was living! With that they would get great big smiles on their faces and burst out laughing and insist that Elmo wanted to jump again regardless of the risk! So I would always consent to take him up with me for another jump. We all greatly enjoyed it. When it was really windy out, sometimes Elmo would end up over 100 feet away from the silo. One time he did end up on the barn roof and stuck there for a minute and then gently slid down. Another time he flew over the barn roof and landed on the feeder wagon on the barnyard. The kids quickly rescued him before a cow could start to eat him! I always tell the kids that Elmo’s parachuting is a high risk business and that’s why insurance agents even inquire about it. But, the kids always tell me that Elmo wants to keep doing it. And I must say we have a lot of fun doing it. Sometimes on a hard work day, it’s the highlight of the day. It’s always good to mix a little fun in with the hard work. Now, Elmo is special here, since Joshua got him when he was a way small baby and we do try to take good care of him. But, Elmo is a stuffed toy. What are far more precious than stuffed toys are children. We need to take good care of them and bless them. We need to be careful not to put them in harms way or to live dangerously ourselves. How do adults live dangerously you ask? By using alcohol and drugs. I can’t tell you the number of marriages and families that these two have destroyed. Also, by not being responsible, loving and caring. Without these three things, marriages and homes can come apart too. If we will love and care for our families as we ought, as God has instructed us to, they will be greatly blessed and we will be also. I know I am here, especially when I let Elmo go from the top of the silo with a big smile on my face! Elmo parachuting from the top of the silo. I remember back many years ago to a very special time in my life, Feb. 14, 1989. It was Valentine’s Day, and it was the third month that I had been dating a very beautiful, Godly lady named Joanne. Even though neither one of us were rich financially, we felt that we should splurge that day and make it really special. It was special to me already because this was the first time in my life that I had a girl friend on Valentine’s Day. I bought Joanne a large heart shaped box of premium chocolates ahead of time to give to her that day. I did the regular farm work that day and then milked the cows that evening in great anticipation of seeing my sweetheart. I dressed up super nice and then drove the 30 some miles to pick up my valentine. When she came to the door, I was stunned. She was absolutely beautiful. Even though that was 23 years ago, I remember it as though it were yesterday. She was wearing a beautiful cream colored dress, with cream colored heels and a sharp red scarf around her neck. After exchanging some greetings and giving her the box of delicious chocolates, we went out to eat at a fine restaurant. Since I had milked cows that evening it put us pretty late and thus the place was virtually empty. We had it all to ourselves except for the cooks and waiters. It looked like I had bought the place out for my special date! We ordered our special meal and when it arrived we thanked the Lord for it. We asked Him to bless it and our time together. The lights were turned down way low as we started to eat and visit. We then noticed a short ways away that somebody had earlier that evening ordered candles for their table. Since the people were long gone, and the candles were still burning, I brought them to our table. We dined like a king and queen that evening. I still remember as if it were yesterday, looking into Joanne’s radiant face that evening in the flickering candle light. I’ve come to realize that God is the author of romance. We visited long that evening and then I took her home. Then it happened. Before I left to go home for the night we kissed each other for the first time. Wow! I am happy to say that we kept our relationship pure before God and man. Several months later in August I had the privilege of marrying my valentine, my soul mate. Every year on Valentine’s Day we think back to our first one and celebrate anew the love God has given us for each other. We also let our children know that they are special to us. So this year I will be getting my valentine a big heart shaped box of chocolates and maybe some flowers too or something else special. Husbands and wives, love your spouse and treat them special. Splurge on them a little. If you have a good spouse they are well worth it. You will build memories that will last a life time. In the end you will find as you bless them, that you are the one that is blessed the most. I know that is most certainly true for me. I still remember that special candle light dinner and kiss! When we bought our farm here many years ago, we were pleased to see that there was a wood furnace in the basement of the house. Buying this farm put us deeply in debt, so we were glad that we could heat our house with firewood instead of costly fuel. So over all these years, I’ve never bought a drop of fuel to heat our home with. Instead it’s been all firewood – and lots of it. Over time, the furnace in the basement came to the end of its useful life. Since we enjoy a nice cozy house in the wintertime to come into after doing chores out in the cold, the decision to stay with wood heat was an easy one to make. This time though, we bought an outdoor wood furnace to heat our home with. In time we named it “Little Smokie.” I like having the fire and firewood outside, it’s a lot safer and less work to keep going. I also like the fact that I don’t have to get up at 2 a.m. on bitter cold nights to reload the furnace. Our outdoor one holds enough wood to keep it going all night long. Another plus with this is that we heat all of our house and milkhouse hot water with it which really helps save money. At times we even take hot water from the milkhouse to melt the ice in our cattle’s water tanks. So doing all this with Little Smokie requires a lot of firewood. But that’s no problem, we have a big woods on our farm and we enjoy making firewood. Every year late in the fall, Catherine, Joshua and I head down to the woods to cut trees for firewood. First we try to cut the trees that have died recently and those that have went down due to storms. After that, we tend to cut trees along the edges of our fields. It’s very peaceful working in the woods in the fall of the year. Often times we see deer, squirrels, chipmunks, raccoons and other wildlife out there. Also, we see many birds out there, including large flocks of geese flying overhead telling us that winter is on the way. But, working out there with large trees and chainsaws can be dangerous too. Sometimes a tree doesn’t fall the way a person thinks it will. So when falling a tree a person needs to be extremely careful. 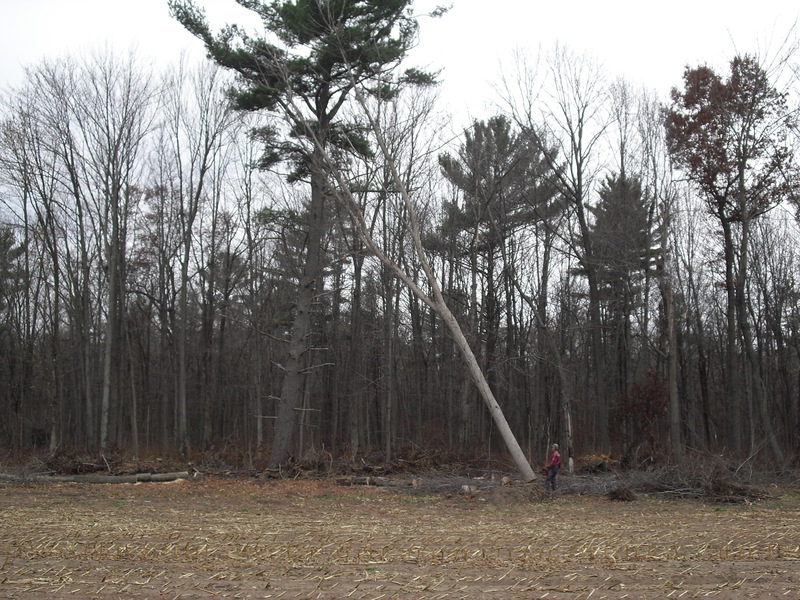 A while back, I decided to cut a large maple tree down that was on the edge of my corn field. I looked it over carefully and decided that it would want to fall to the north. So I cut a small wedge out of the north side of it and then started cutting through from the south side. Well, I got almost through and then the tree instead of falling to the north came back and pinched my chainsaw tight. I knew I was in a dangerous situation. I looked it over carefully and prayed for wisdom. I decided the best thing to do would be to get the five log chains that I had on the tractor that I drove to the woods that day, hook them to the tree and pull it to the north. I’ve always told my helpers to always keep their eyes on a tree that’s been partially cut when working around it because there is always the chance it could go down unexpectedly. People have gotten hurt and sometimes killed in such situations. So when my chainsaw got stuck I asked Joshua to bring a log chain and put it on the north side of the tree reminding him to keep an eye on the tree at all times. He got the first chain and put it there while I went after a second one. I was putting my chain on the north side of the tree and following my own advice – keeping my eyes on the tree at all times. It’s a good thing that I was! As I was about to put my chain down, a small breeze picked up out of the south. The large maple tree started to come straight north. Immediately, I dropped my chain, stepped back and to the side of the tree trunk, grabbed my chainsaw, which was now free, and pulled it out. The tree crashed down right on top of the chain that I had just dropped on the ground seconds earlier! If I hadn’t followed my own advice and kept my eyes on the tree, I would have been killed! The way it was, we were all perfectly safe and we gave thanks to God. I have always sought to give my children good advice and to follow the advice I give them. Too many times parents tell their kids, “Do as I say and not as I do.” Many children do as their parents do and end up ruining their lives. Parents need to realize that their actions speak a lot louder than their words. But, when their actions line up with their words they leave a powerful lasting impression on their children’s lives. The Bible says, “Train up a child in the way he should go: and when he is old, he will not depart from it.” This is most certainly true, but we must realize that we need to live rightly before them everyday ourselves. Then we can expect them to listen to us, follow our example and be blessed. If we do this we also will be truly blessed. I know I am, the big maple tree crashing to the ground didn’t hurt me a bit. 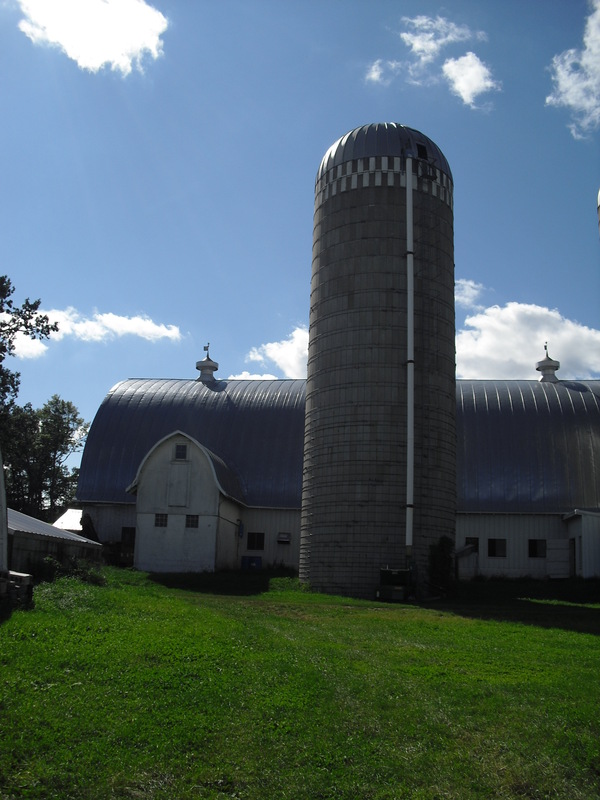 Tom Heck, his wife Joanne, and their two children, Catherine and Joshua, own and operate a 35 cow, 159 acre dairy farm in northwestern WI. 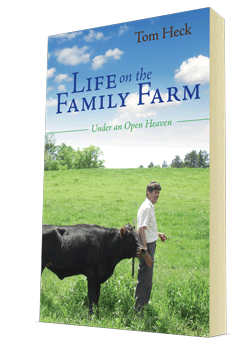 Contact Tom at: lifeonthefamilyfarm@gmail.com Copyright © 2014 by Tom Heck. All rights reserved.